Brand new 130+dB Alarm with powerful LED torch. Activated by pulling the keyring from the alarm. To stop, simply replace the pin. Designer looks in black with grey button. 3 x AG13 (LR44 or equivalent) batteries pre-fitted. Replacements are readily available at most high street electrical retailers. Councils, NHS Trusts, Govt. Bodies and Charitable Organisations should contact us to discuss flexible payment terms. Simply slip this into your pocket or bag. 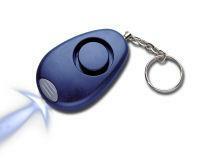 Our new Keyring personal safety alarm comes with a powerful mini torch facility offering fantastic value and convenience. Sound output measures 130+ dB with batteries pre-fitted, designer looks in black and grey. The Power Torch Keyring Personal Safety Alarm is designed to fit easily into a pocket or handbag so that it is a convenient deterrent for everyone. To activate pull the keyring attachment out of the alarm. To de-activate, replace the pin into the alarm. On the top of the Power Torch Keyring Alarm towards the front, is the torch facility button. Remember, if you feel unsafe, activate your alarm, if you are wrong, just apologise. Length 6.75 cm, Width (At widest Point) 4.2 cm, Height only 1.5 cm. The unit operates by 3 x AG13 (LR44 or equivalent) button-batteries. When the alarm sound or torch light goes low, simply remove screw from back cover and replace new batteries with correct polarity. You should always try to avoid situations which may threaten your personal safety. Trust your instincts, if you are travelling to an area you may consider dangerous let someone else know where you are going. The 'Power' Torch Keyring Personal Alarm is designed to add to your personal safety by being conveniently available at all times and designed to come clear of your keys when the alarm is triggered. This is important in order that you do not lose your keys under these circumstances. Do not keep all your keys on one keyring. If you have concerns about the safety of a situation or place that you find yourself in, always have your alarm to hand. The Patriot Personal Attack Alarm is a functional unobtrusive alarm similar in looks to a car remote key. It has been designed with women in mind. When activated it sets off a 130 decibell alarm thus making it a very suitable deterrent for women who find themselves in a vunerable situation. 130 Decibell high frequency alarm made of tough ABS construction. Supplied with a keychain and rip-cord activator. Activated by pulling the rip-cord or keychain to pull out the pin. To de-activate, simply replace the pin. 3 x LR44 Batteries pre-fitted. Replacements are available at most high street electrical retailers. Approximate dimensions ( Oval Shape ) : 6 cm long x 3.7 cm wide x 2.1 cm high. The Patriot Personal Attack Safety Alarm produces a high frequency alarm sound and ultra bright LED light. It is ideal for almost everyone with concerns for their personal safety. 1) Access the battery compartment by removing the 2 screws on the back of the alarm with a small phillips screwdriver. Gently pull off the back cover from the alarm. 2) Replace (3) LR44 button batteries noting polarity. 2) Re-fit the back cover and tighten screws. To activate the alarm hold the alarm in one hand and with the other hand pull the keychain or ripcord out of the alarm. To stop the siren insert the pin back into the alarm body. To operate the light just press and hold the button located on the lower position of the unit. Warning the high output siren alarm fitted to this quality personal alarm may cause ear damage if usedat close range for a prolonged period of time. Keep away from children and pets. This personal alarm is designed to increase your personal safety by being convenient and accessible whenever it is needed. The alarm is intended to shock any attacker. In this respect the balance of power within a situation, which up to this point has been controlled by the attacker, is evened out. You should then take this opportunity to get away from the scenr immediately. They alarm may well attract help but do not rely on it. If assistance does come, consider it a bonus. Your first priority is to get as far away as quickly as possible. The Patriot Personal Alarm with Torch is designed to detach from your keyring in the event of an attack leaving you safely with your keys having distracted your attacker. Try not to have all your keys on one ring.